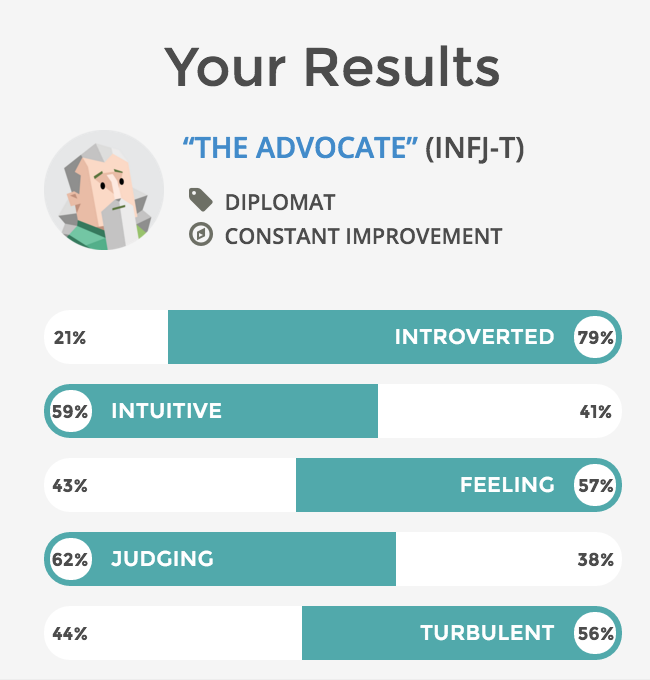 I did a personality test at https://www.16personalities.com/ and here is what it came up with. Now like any other personality test on the internet, I know to take the results with a grain of salt. Just because I answered some questions and they gave me this result, it does not necessarily describe who I am. I wonder if I had answered one question differently or if I happened to be in a different mood if I would have gotten something completely different. I think its likely. When I read the results it sounds like it hit the nail spot on but I'll keep the Forer Effect in the back of my mind when doing the analysis. INFJs are often perfectionistic, looking for ultimate compatibility, and yet also look for someone with whom they can grow and improve in tandem. Needless to say, this is a tall order, and INFJs should try to remember that they are a particularly rare personality type, and even if they find someone compatible in that sense, the odds that they will also share every interest are slim. If they don’t learn to meet others halfway and recognize that the kind of self-improvement and depth they demand is simply exhausting for many types, INFJs are likely end up abandoning healthy friendships in their infancy, in search of more perfect compatibilities. Really the only way to be counted among INFJs’ true friends is to be authentic, and to have that authenticity naturally reflect their own. INFJs don’t require a great deal of day-to-day attention – for them, quality trumps quantity every time, and over the years they will likely end up with just a few true friendships, built on a richness of mutual understanding that forges an indelible link between them. First and foremost, INFJs need to find meaning in their work, to know that they are helping and connecting with people – an INFJ Ferrari salesperson is a non-sequitur. This desire to help and connect makes careers in healthcare, especially the more holistic varieties, very rewarding for INFJs – roles as counselors, psychologists, doctors, life coaches and spiritual guides are all attractive options. For INFJs, money and Employee of the Month simply won’t cut it compared to living their values and principles. These needs are hard to meet in a corporate structure, where INFJs will be forced to manage someone else’s policies alongside their own. For this reason, people with the INFJ personality type are more likely to, despite their aversion to controlling others, establish their independence by either finding a leadership position, or simply starting their own practice. As independents, sole proprietors in the parlance of business, INFJs are free to follow their hearts, applying their personal touch, creativity and altruism to everything they do. This is the most rewarding option for INFJs, as they will step out of the overly humble supporting and noncompetitive roles they are often drawn to, and into positions where they can grow and make a difference. INFJs often pursue expressive careers such as writing, elegant communicators that they are, and author many popular blogs, stories and screenplays. Music, photography, design and art are viable options too, and they all can focus on deeper themes of personal growth, morality and spirituality. Where INFJs fall flat is in work focusing on impersonal concerns, mundanity, and high-profile conflict. Accounting and auditing, data analysis and routine work will leave people with the INFJ personality type fidgety and unfulfilled, and they will simply wilt under the scrutiny, criticism and pressure of courtroom prosecution and defense, corporate politics and cold-call sales. INFJs are clever, and can function in any of these fields, but to be truly happy, they need to be able to exercise their insightfulness and independence, learn and grow alongside the people they are helping, and contribute to the well-being of humanity on a personal level. Multiple sites have claimed that INFJs are extremely rare (< 1%). I had always assumed that I was an INTJ based on what I have read about them as it is pretty obvious that I am introverted. I think most people will know easily if they are the I(introvert) or E(extrovert). The S(sensing) vs. N(intuition) is a bit trickier. This quiz says that I am slightly more N but I took another test that said I was much more towards S.
The F(feeling) vs. T(thinking) is the biggest surprise for me. But in looking back, I can certainly see some of the traits in action. As a manager, I was always very people first, and made extremely strong connections with those that I had managed. Even as an engineer, I'd consider how people felt and try to address those issues along with the raw technical issues. I am more J(judging) than P(perceiving). I like to approach life in a structured way and make decisions early rather than keep all my options open. If I get an email that needs a decision, I'll make one and reply right away. Everything is acted upon right away (although sometimes that decision is to delay). Although I like to keep my general life options as wide open as possible, usually when I am faced with smaller decisions, I have no problem making them and accepting the consequences. Overall I think this result makes sense. It explains why I have a few high quality friends and am perfectly happy with that. It explains how work is not just an exchange for money and has much deeper meaning; and why I would walk away from a job with such great pay. It explains why I am attracted to working and living independently. Again, taking this with a grain of salt. I think so many of the questions I could have answered either way and most of them I'll respond with "well it depends on the situation". But it was a fun exercise anyway.